The Sonoma Speaker Series is partnering with Transcendence Theatre Company to bring Donna McKechnie to our stage! McKechnie is a professional dancer, singer, actress, choreographer, and author whose illustrious career has spanned more than 50 years. She is regarded internationally as one of Broadway’s foremost singing and dancing leading ladies. Donna is best-known and beloved for her portrayal of Cassie in the original Broadway cast of the 1975 musical, A Chorus Line, for which she received the Tony Award for Best Actress in a Musical. Her featured number, "The Music and the Mirror," sheds a spotlight on the hopes and dreams of a struggling dancer, willing to return to the chorus for a job doing what she loves. Born in Pontiac, Michigan in 1942, McKechnie grew up in the Detroit suburbs before falling for musicals by going to the movies. After seeing the film, The Red Shoes, she took her first ballet class at age 7, and by 13 she was teaching her own class. "I was terribly shy," she told People Magazine in 1983, "but I was always in harmony when I was dancing." “I knew about New York when I was very young because of Cyd Charisse, Fred Astaire and Ginger Rogers, then The Red Shoes literally changed my life,” McKechnie said. At age 17, when she didn’t have the support to pursue her dream, she ran away from home and moved to New York City to become a dancer. After touring in West Side Story, and auditioning for countless other shows, she finally landed her Broadway debut in How to Succeed in Business Without Even Trying, where she danced under the direction of Bob Fosse (1961). 25 years later, Mr. Fosse invited her to play the lead in his last production, the National Tour of Sweet Charity. Gwen Verdon gave her the gift of a lifetime when she took Donna by the hand and personally prepared her for the role. By the time A Chorus Line hit Broadway, it was already a phenomenon, becoming the longest-running show in history (1975-1990). While that record has since been broken — the current leader is now The Phantom of the Opera (1988-present) — the music of Marvin Hamlisch lives on. and, A Funny Thing Happened on the Way to the Forum. Donna continues to perform extensively on the concert stage and with symphony orchestras all over the country. A recognized presence on the international stage, Donna first performed in London in 1969 with the musical Promises – Promises and has starred in numerous productions in London’s West End since, including Company, No Way To Treat A Lady (also choreographed), Can-Can, and Follies, among others. McKechnie was featured in the documentary film, Every Little Step, and played Rose in the film, The Little Prince. Her memoir, TIME STEPS – My Musical Comedy Life, was published in 2006. Ms. McKechnie will be in conversation with Amy Miller, Artistic Director for Transcendence Theatre Company. Transcendence will be launching their 2019 Broadway Under the Stars season by performing their first full-length Broadway musical, A Chorus Line, at Jack London State Park in June. Members of the cast will be on hand for this Speaker Series event and may even perform a song or two! 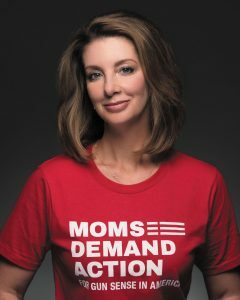 Shannon Watts is a mother of five who, prior to founding Moms Demand Action for Gun Sense in America, was a stay-at-home mom and former Communications Executive. The day after the Sandy Hook tragedy, Watts started a Facebook group with the message that all Americans can and should do more to reduce gun violence. That online conversation has grown into a nationwide grassroots movement of Americans fighting for public safety measures that respect the Second Amendment and protect people from gun violence. Moms Demand Action has established a chapter in every state of the country and is part of Everytown for Gun Safety, the largest gun violence prevention organization in the country, with over 5 million supporters. Watts’ fiery and sharp social media presence promotes awareness and brings important issues to the forefront. With the same candor, Watts frequently leads passionate and informative keynotes and conversations across the country to audiences ranging from parent organizations to women’s leadership conferences to colleges and universities. In addition to her work with Moms Demand Action, Watts is an active board member of Emerge America, one of the nation’s leading organizations for recruiting and training women to run for office. In 2018, she was named one of InStyle Magazine’s Badass Women, one of People Magazine’s 25 Women Changing the World and a Yerba Buena Center for the Arts 100 Honoree. Watts’ writing has appeared in Vogue, Refinery 29, Time, The Washington Post, The Hill, and other media outlets. In her debut book Fight Like a Mother: How a Grassroots Movement Took on the Gun Lobby and Why Women Will Change the World, Watts tells the inspiring story of how her rallying call-to-action grew into a social movement powered by mothers to protect children from America’s gun violence crisis and offers lessons for others who want to make a difference in their community. The book is scheduled for release on May 28, 2019. VIP tickets will INCLUDE a book with purchase. General Admission ticket holders can pre-order a book by contacting Sonoma’s LOCAL BOOK STORE, Readers Books (707-939-1779). Click here to buy. Shannon will donate a majority of the books' proceeds to nonprofits -- like Everytown for Gun Safety -- that are working to end gun violence. Bringing activism into the everyday, Fight Like a Mother will inspire everyone—mothers and fathers, students and teachers, lawmakers, and every citizen outraged, angry, and motivated to work for change—transforming hearts, minds, and laws, and most importantly, show them how to honor their values with action. Along with her observations and wisdom, Watts shares inspiring messages of perseverance, courage, and compassion, and outlines the core mantras and principles that Moms Demand Action has used to battle the NRA and the intimidating tactics they use to prevent gun safety progress. Watts proves that a woman with a laptop can be more powerful than a man with a gun!